Showing results for tags '77184'. Greetings my friends! I started this pair alongside the Wraith Harvester and Reven Beastman at Starbucks a week and a half ago. I just finished this pair up and thought I'd post pictures; they're larger and just took my time to complete but both are rough speed paints. The Spirit of the Forest was originally going to be a fall motif, but I decided that I wanted to do a warm to cool contrast so you'll note that on the upper levels he's receiving some warmth and down towards the earth there are much cooler tones. The 14 colors I used were: Red Shadow, Splintered Bone, Brown Liner, Worn Navy, Brilliant Green, Redstone, Gory Red, Driftwood, Ultramarine Shadow, Fresh Blood, Tanned Leather, Faded Khaki, Auburn Shadow, Rusty Red. Total paint time about 4.5 hours. For the Large Earth Elemental I just wanted to make him cold, snowy and icy; this provided for a nice light to dark contrast. I actually had to pick up some fresh rock candy crackle paint at Hobby Lobby for the cracked ice. The 8 colors I used were: Worn Navy, Brown Liner, Red Shadow, Brilliant Green, Splintered Bone, Sapphire Blue, Light Blue, Pure White. I like elementals to have empty sockets/no eyes so those were left intentionally dark. Total paint time/ice/snow included about 4 hours. Probably the last one I'll post until tomorrow, trying not to clutter the boards too much with a flood of my stuff (the main reason I used to do consolidated posts). This model was a blast to paint. Super quick, easy to get great effects on. I've seen the grass/scenic elements on a few of these already, so I won't go into details, but it's a super easy way to get some nice detail on there. So I picked up the bones Spirit of the forest figure the other day and wanted to do something different with him. Maybe put him in the giants contest even. I've seen hime done up as an oak or redwood or even pine. I'm thinking of another type of tree entirely. I'm leaning toward painting him as a Birtch tree. The base I've chosen is one of the Secret Weapon Swamp bases. These are designed to be filled with realistic water once painted to give a swamp look. He fit nicely after flattening the underfoot areas on the base. I added a few extra skulls from secret weapon's bag of skulls onto the base which will end up under the realistic water. But that wasn't enough... I needed something else of interest. He looked too static as is. SO Into my bag of bones (hehehe) out came one of the bones skeleton archers. YES! this could work great! I added a skull to the top of the left fist and cut the pelvis off of the torso and glued it to the bottom of the same fist. This definately gave the figure more motion. Just what was needed. I trimmed the rest of the skeleton and added it to the base. and Voila! Here he is. Tomorrow I will begin adding paint and figuring out how to paint a birch pattern. Here's some pics of the final assembley... Any comment or critiques or off topic coolness welcome! After finishing painting over 100 Bones miniatures (not to mention my Dwarven Forge Game Tiles as well), I suppose it is probably time I started sharing them. First up is one I am very satisfied with and was happy to support when it was an Add-on for the first Bones Kickstarter. Here is the Large Earth Elemental, 77185, from different angles because the figure is full of details: And here is the Spirit of the Forest, 77184, again, several angles because there are a lot of little details: I had fun painting these two and picking out the amazing little details on each one. 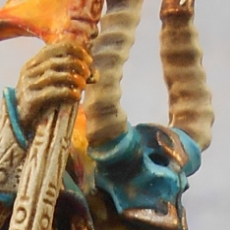 For anyone interested my signature has a link to my Flickr photo album with pictures of the other Bones I have painted.